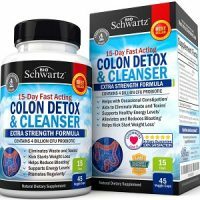 BioSchwartz Colon Detox and Cleanser Review - Worth The Hype? 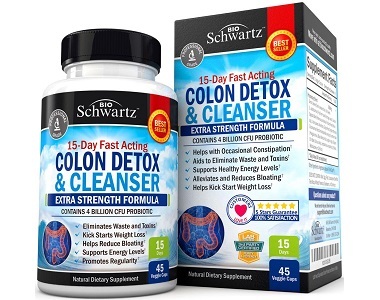 BioSchwartz advertises that their 15-day detox supplement will ensure rapid results of a flatter stomach, fresher breath and promotes regularity of the digestive system. This formula focuses on eliminating any waste build-up in the colon and restoring the body’s natural flora. Today we are conducting a review of BioSchwartz Colon Detox and Cleanser by taking a closer look at all the facts in order to see if this is the most effective detox supplement on the market. What’s in BioSchwartz Colon Detox and Cleanser? There are two aspects to this formula, the proprietary blend, and the probiotics. Senna Leaves, Psyllium Husks, Cascara Sagrada and Buckthorn Bark are considered as natural laxatives, this helps to flush toxins from the colon, Cascara Sagrada and Buckthorn Bark are also known to support healthy liver function. Flax Seeds have anti-inflammatory properties and are high in omega fatty acids as well as fiber. Glucomannan Root helps to regulate cholesterol and blood sugar levels which aid in weight loss. Rhubarb is known to for aiding digestive conditions such as constipation, diarrhea, heartburn, stomach pain, and gastrointestinal bleeding. The probiotics found in this formula are Lactobacillus Acidophilus and Bifidobacterium which help to restore a healthy flora environment in the colon. How Do You Use BioSchwartz Colon Detox and Cleanser? We were unable to find any recommended dosage online. The only information we found was that the serving size is based on 1 capsule. 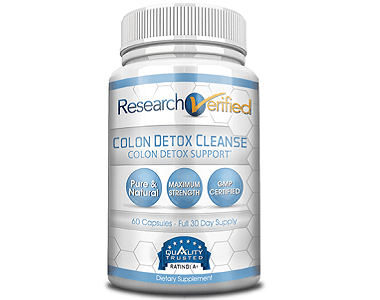 Colon Detox and Cleanser costs $16.95 for 45 capsules. The product can be purchased online directly from the manufacturer or third-party suppliers. Unfortunately, there are no promotions currently for this product. Fortunately, this product comes with a 30-day satisfaction guarantee. In order to qualify for a refund, you would need to contact their customer care department within the 30 days. After discovering the facts, we found a few positive aspects of this product such as the money back guarantee policy and the fact that this product does not contain any additional fillers or binders. With that being said, we also came across a few downsides. Most of the ingredients in this product have a laxative effect and it may not be very safe to use over a 15 day period without taking extra care to keep yourself hydrated. It is also concerning to see that there is limited information about the recommended dosage. We found various negative reviews from consumers who complained about side effects and the ineffectiveness of the product.